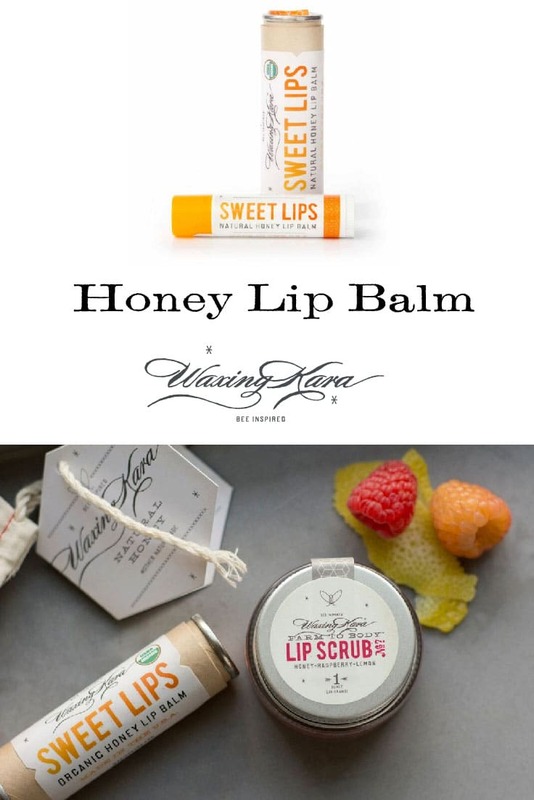 Sweet Lips Honey Lip Balm is made with only natural ingredients and is designed to moisturize and nourish lips. Sunflower and aloe vera oil give soothing protection, while honey and vitamin E provide long lasting hydration. Our Honey Lip Balm is free from artificial ingredients, colors, and flavors. USDA Certified Organic. Sweet Lips Honey Lip Balm smoothly glides on with a slightly-sweet honey finish. There are no artificial flavorings in any of Waxing Kara’s lip products. Made entirely in the USA, our Honey Lip Balm is USDA Certified Organic. Paraben, phthalate and GMO free. Made without petroleum products, so it is better for you and the environment. You’ll notice immediately softer, smoother lips with just one application! 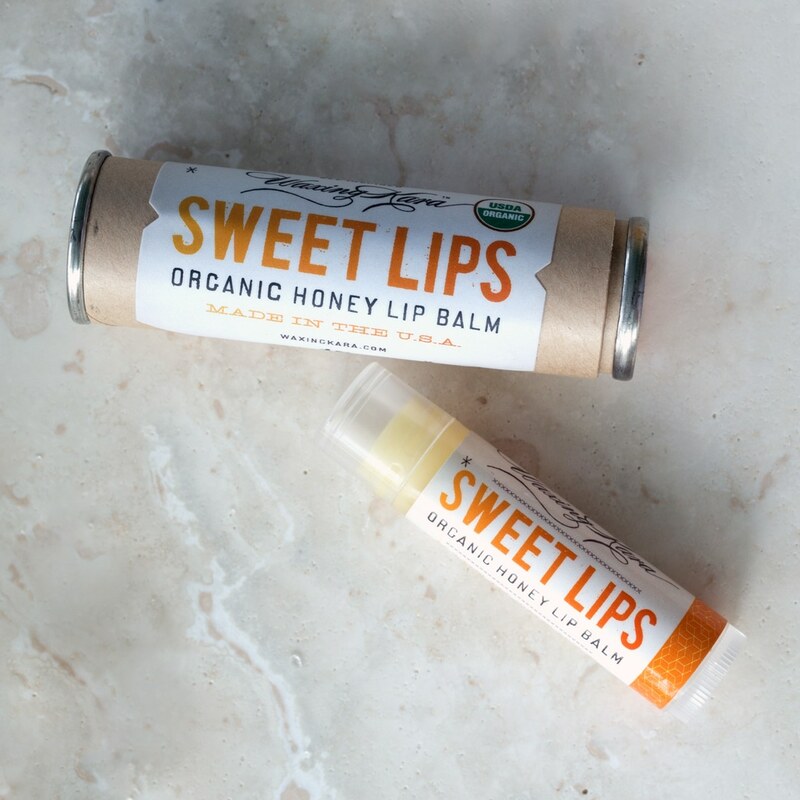 The combination of plant oils and honey in this balm quickly absorb into your lips, leaving behind no goopy or waxy finish like so many other products. Perfect for those with constantly dry lips and sensitive skin-there are no added colors, flavors, or fragrances in our Honey Lip Balm. Use for an overnight treatment and wake up with incredibly soft, smooth lips. Light enough for daytime use as well: use under your favorite lipstick or by itself for spectacular moisture. If you love our Lip Balm, share a selfie on Instagram with the tag #waxingkara! We love to see your photos. Who it’s for: A soothing, lightweight balm for dry and chapped lips. Color: None at all! It goes on completely transparent. Flavor: Slightly sweet and very natural. Tried this sample from a friend of a friend this weekend! Amazing! So smooth and not at all waxy! I am super excited for it to be ready for sale and plan to use it as my go-to Xmas stocking stuffer and hostess gift! love the packaging – adore everything about it!! I love this lip balm! makes my lips soft and moisturized without feeling heavy or waxy. since it’s all natural that makes it even better! the packaging is perfect for gift giving, too. a great addition to all the other fabulous honey products. I’m obsessed!! You can’t go wrong with these ingredients and it feels amazing on your lips! Thank you Lauren! I am glad you love it! I appreciate the feedback. Happy New Year. I love this lip balm! It has a smooth feeling on the lips and light honey taste – my favorite! Just got mine on Ipsy today, and I love it soo much I wore it when I opened my package.It seriously left my lips so smooth. Angela it’s great to hear from you and we’re thrilled you are enjoying our Honey Lip Balm! HOLY!! Ipsy sent me this, and wow! You dont even know you’re wearing balm until you rub your lips together and feel how amazingly soft they are. First impression? So glad you are enjoying your Sweet Lips Ashley! Goes on very light without leaving a thick layer like other lip balms. Leaves NO nasty taste! Recommended! Left my lips really soft! I got mine on ipsy too and it’s probably the best product they’ve ever sent me. By far the best lip balm I’ve ever tried. Will definitely be purchasing some of this for Christmas gifts. Thanks Danielle! We’re so happy to hear from you. Enjoy! I got this in my ipsy bag, and I had to rush right over here to leave a review. I am a lip balm junkie. Seriously, I have a drawer dedicated to failed attempts at new lip balm. I avoid buying pants without pockets. There used to be a website (a loooooong time ago) that was nothing but lip balm and I placed several orders. I will say that I’ve never paid more than probably $15 for a lip balm, so I don’t know about the pricier brands, but if it’s in the cheapish range, chances are I’ve tried it. After all of that, I am declaring this the best I’ve ever tried. Yup, that’s right. It is smooth and gives me the exact feeling I like, which is moist but not goopy. I like to be able to rub my lips together and feel that it’s there but not notice it otherwise, and this product achieves that perfectly. One of my criteria for evaluating a new lippie is how long does it stay slippery enough for me to rub my lips together and still feel like there’s still enough of it there. This stuff beats anything I’ve tried except for ointment formulas that I’ve sometimes worn overnight. I put this on before sleepytime and six hours later (no, I don’t sleep enough) it’s still slippery. Allow me to repeat that. SIX HOURS LATER IT’S STILL SLIPPERY! That’s bananas. It doesn’t have any scent or flavor, which I prefer, and it’s not a weird size or shape of tube, which I appreciate. There’s a reason lip balm is in that tube, people, don’t mess with it. Bottom line: this stuff rocks! Thank you so much Keara! We are so happy you love it! I got this in my Ipsy bag and I absolutely love it! It’s the best chapstick I’ve ever used and I’ve used many. Leaves my lips super soft and I don’t have to reapply often like others. Also my lips don’t peel. I tried it by chance since I’m very picky and was in love with the first try. Thanks Mariana! It’s great to hear from you and we’re thankful for the kind review! Thanks Lindsay! Glad you are happy! My lips have recently been super dry, so I’ve taken to having lip balm everywhere. In my car, my purse, whatever. I got this in my ipsy bag and I am in love. This stuff is so good, when I use other lip balms, I can feel how much better this one is. My lips are more moisturized, they are softer, and I reapply way less. This is the most amazing lip balm I have ever had the pleasure of owning! I received this product in my Ipsy September Glam Bag! I was a little hesitant to try it out because the bag contains high end products, and I wanted to conserve it. It was laying in the bag and I finally decided to use it. I’m in love. It is so smooth, and it’s not waxy textured at all. It feels like my lips have been in heaven, and I don’t feel the product on my lips, which is good. It’s lightweight, and I love it so much. I will definately be purchasing. I just ran out and will probably be buying again. It ran out pretty quick less then a month but I do use it constantly. It’s the only chapstick that seems to help keep my eczema under control around my lips. I first tried this last year from my ipsy subscription. Thanks for sharing Karol. We’re glad that you are happy with our honey lip balm. All the best to you. Received in my ipsy bag and I love it! Will definitely be purchasing in the future! I absolutely love this lip balm. It is the only lip balm that does not make my lips peel! I won’t use any other kind! I love it! I love this lip balm! Burts Bees used to be my favorite, but this is so smooth and glides on so well that I can’t go back. I would recommend this to everyone! Thank you! We are happy to hear you are enjoying our honey lip balm. Received this in my ipsy bag. Loved it! Ordered 2 more, along with other items I cannot wait to try! Got this in my ipsy bag and I absolutely love it! But so did my dog…he ate it… :( So i definitely need replacement! I use chapstick constantly, but with this i dont have to use it as often, it last so much longer and feels so much nicer!! Halley, Your dog has good taste in lip balm! Thanks for letting us know. If you set up an account, you will earn points towards your purchase! I love this lip balm. It is so smooth and hydrating. It’s also one of the few lip balms that my boyfriend isn’t allergic to! Incredibly moist and lucious. My BFF in NC requests this balm whenever she knows I’m making a purchase. Just a lovely lip balm. Yes, these are better than all the rest. No icky smell or taste and a beeutiful texture! I love this! I use chapstick constantly, but with this i dont have to use it as often, it last so much longer and feels so much nicer!! 3rd review, didn’t know I had to make a purchase off the site in order for it to count my points. Now I have officially ordered this chapstick. Still love it, so smooth and nourishing. This is hands down the best chapstick I’ve ever used. I first received it in an Etsy bag, and immediately fell in love. It’s so moisturizing and I only need to use it once a day. I try to stick with organic products,, especially when it comes to my skin. I usually stay away from anykind of chapstick because it makes them worse. This is the only chapstick I have ever used that actually helps my lips. I love it! This is an absolute must have. Doesn’t get sticky or leave a residue. Just re-ordered for my 4th time! And shipping is super fast! Thank you Shaina! It’s GREAT to hear from you. We’re so happy that you keep coming back. All the best to you! The best lip balm I have ever tried. I received it in an Etsy bag and tried it because I have THE NASTIEST CHAPPED lips. I would spend an endless amount of money on any product that anyone suggested to me and NOTHING would work- and if it did, it would stop working after about a month’s use. I now have three of these strategically located where ever I go and I haven’t had chapped lips in months. I am OBSESSED. Light weight, super smooth and works perfect. I recommend it to everyone. Maya! It’s wonderful to hear from you. Thank you for sharing! This is the most amazing lip balm I have ever used! I got this product in my ipsy bag over a year ago (I’m not sure if you’re supposed to keep lip balm for that long, but that’s how long mine lasted using it a few days a week). I’m only just now getting to the bottom of it, and I HAVE TO HAVE MORE. It is so soft and silky. It is the only lip balm I will use now. I’ll be placing an order right away! I absolutely LOVE this lip balm! Now that Ive been using it, whenever i have to use chapstick it just feels sticky and my lips still feel dry. This stuff actually moisturizes my lips and calms my nerves. Thanks!! Love this stuff. I received a free sample from somewhere, that I can not remember, Maybe Ipsy. I loved it so much I have purchased two more since then. Looks like you are wearing lip gloss. Can’t wait to try a tinted one. Love the packaging for this lip balm! Very moisturizing! I don’t have to keep reapplying, unless I just wanna feel its goodness. Thank you! I am not joking when I say I am allergic to all products. I started using honey as a mask awhile ago and was randomly googling and came across this site and ordered this lip balm to try and I will never use anything else. It’s moisturizing and doesn’t cause that weird white chapstick line and best of all I’m not allergic! Thank you for your products! Lisa, Thank you so much for sharing your experience with our honey lip balm. I am so happy to hear that it’s working for you! My all time favorite lip balm! I’m allergic to a lot of common ingredients in most lip balms, and this is the ONLY one that doesn’t break me out! Will never stop using this. Thank you so much for sharing! Enjoy! This is the best lip balm EVER! After trying this I cannot use anything else. I have never tried such a great product, I am very picky about lip balms and this is the best one for me, nothing else does what this does. Leaves my lips very moisturized and soft. Cannot say enough great things about this balm. Will be continuing to use this always. Thanks so much Monica! Enjoy! This lip balm is amazing. It not only protects lips, it actually heals raw, dry lips. I put it on at bedtime and my chapped lips are healed by morning. I’ve never found anything like it! Great to hear from you Melissa and that you are enjoying our bee inspired sweet lips!